While no physical trace of Berkeley Square exists on the modern landscape of Los Angeles—except, perhaps, for a short stretch of north roadway curbing—Brigadoon was here: above, an overlay of a 1921 Baist insurance map onto the modern city gives the position of the Square in relation to the highway that now plows through it. 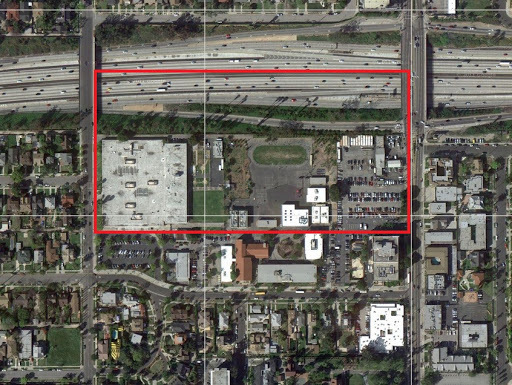 The Santa Monica Freeway—the swath of yellow across the top—condemned the northern half of the Square; the expansion of what was originally the 24th Street School (the blue rectangle at center) condemned the southern half. 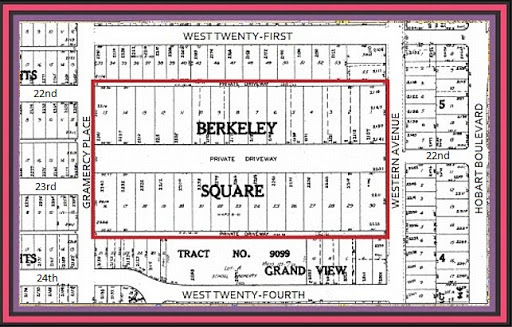 (The misspelling of "Berkeley" as "Berkley" dates from earlier Baist maps and went uncorrected despite the BERKELEY SQUARE tract designation on top of it.) 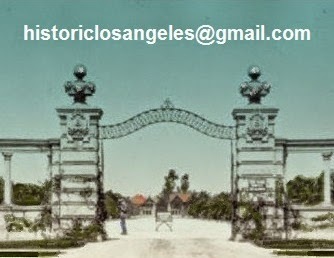 Such was the cachet of the Square in its halcyon days that reference was often made to it in real estate advertising for houses outside of the gates, on property as far-flung as Adams Street to the south and 20th Street to the north. 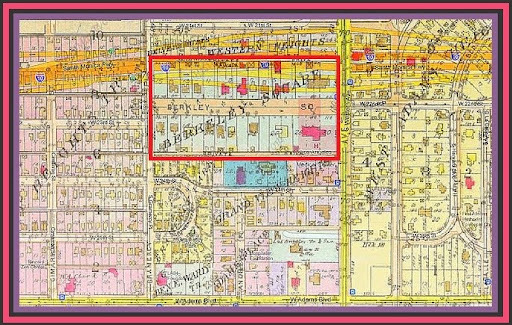 Above, a more detailed view of the Square in relation to the immediate street grid appeared in the 1947 plat book issued by the Realty Map & Ownership Service of Los Angeles. 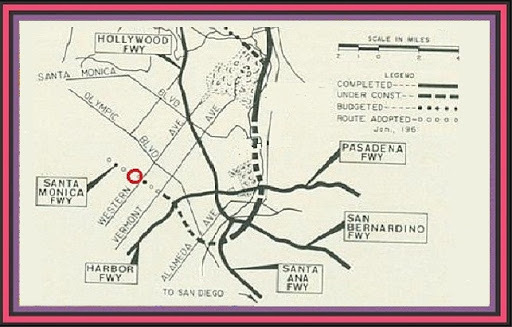 Below is a 1961 highway department map indicating the Santa Monica Freeway under construction on its finalized route—the red circle indicates the doomed Square. 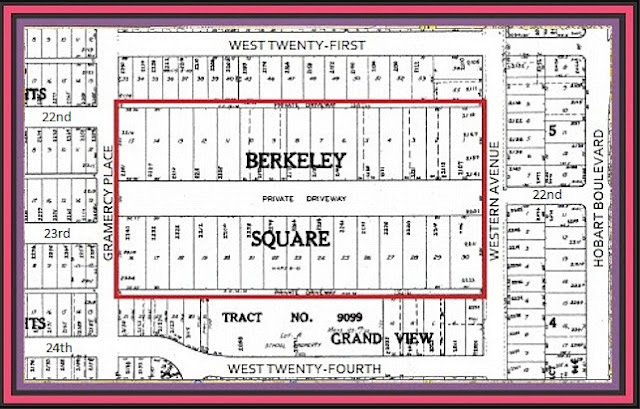 Interestingly, the original delineation of the central Berkeley Square roadway and those of the 15 south-side lots remain as ghostly, unrecognized lines on present-day Los Angeles Department of City Planning maps (which the department calls its Zone Information and Map Access System, or ZIMAS for short). The author-added red rectangle indicates the lost Square. The green color above indicates current zoning for public facilities, such as government buildings, public libraries, and, in this case, public elementary and secondary schools. The Twenty-fourth Street School—indicated by the red-roofed building seen at center below in a 2012 satellite view—remains where it has been since 1904, the year the gates of Berkeley Square were completed. The large building at left within the Square is the J. P. Widney High School. The magenta color above indicates zoning for commercial purposes; the purple, for parking.